Despite my desire to try new things in the kitchen, I feel very lucky for not having serious food allergies and also for not having to give up gluten or dairy – I was a vegetarian for many years and that wasn’t hard, but I don’t think I would last one week without bread or cheese. Pasta is another staple I’m not willing to eliminate from my diet, not only because it is delicious but also because it is a very versatile ingredient: it can be made in so many different ways, the sky is the limit. When I’m in a hurry to make dinner or the refrigerator is empty pasta always saves the night. That is why I was so eager to buy Antonio Carluccio’s book on the subject and he didn’t disappoint: it is oh, so beautiful, and the recipes look mouthwatering – I want to cook everything from that book. Preheat the oven to 120°C/250°F. Prepare the spinach balls first by cooking the spinach leaves in salted water for a few minutes. Scoop out and leave to cool. When cool, squeeze out most of the moisture and chop the leaves with a knife, but not too small. Then mix in a bowl with the garlic, nutmeg, breadcrumbs and Parmesan. Add the egg gradually, mixing until the mixture comes together (you might not need the whole egg). Season with salt and pepper. Roll mixture into balls (you’ll get about 10) and shallow-fry in a tiny bit of canola oil until they brown on all sides. Keep them warm in the oven while you make the rest of the recipe. Meanwhile, make the sauce: heat the oil in a large saucepan, and add the garlic, chilli and squash to the pan. Cook quickly in the oil, about 3-4 minutes. Add salt and pepper to taste. Drain the pasta and mix it with the sauce over high heat, to cover and warm everything up, then divide between warmed plates. 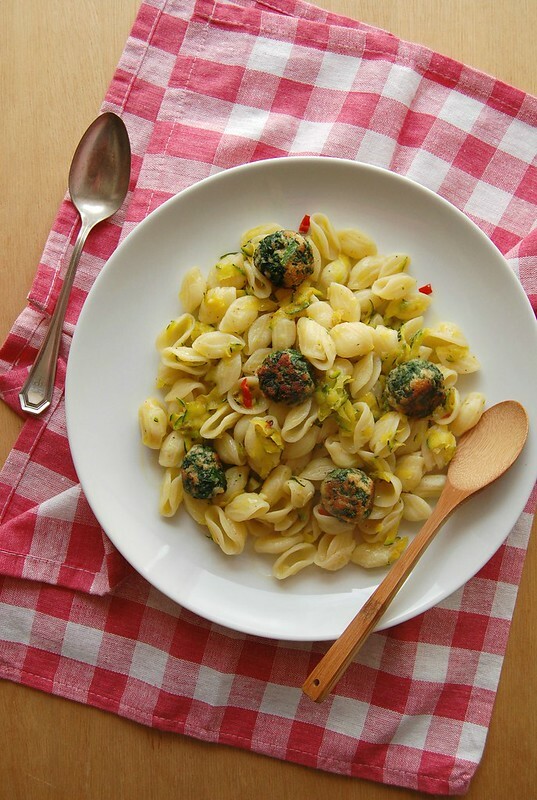 Drizzle with extra-virgin olive oil, sprinkle with parmesan and place four or five spinach balls on top. Serve at once. Yours turned out beautiful, I like that you can actually see the leaves...Great pasta dish! Orecchiette is my favorite, what a great pasta!